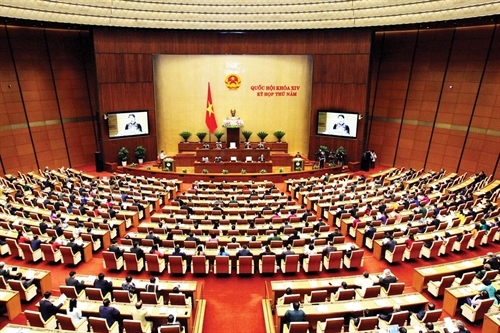 The fifth session of the 14th National Assembly (NA) opened in Hanoi on May 21, with eight laws expected to be passed during the event that will last for 20 working days to mid-June. As scheduled, lawmakers will spend 12 days on lawmaking work, including debate and adoption of three new laws on special economic zones, topography and cartography, and cyber security; amendments to four other laws concerning denunciations, competition, national defense, and physical training and sports; and revisions to the laws related to the Planning Law. The NA will also give comments on three drafts laws on livestock production, crop production, and coast guard; and draft amendments to five laws on corruption prevention and combat, people’s public security force, special amnesty, education, and higher education. Addressing the opening ceremony, NA Chairwoman Nguyen Thi Kim Ngan said the draft laws to be passed and debated at the session have extremely great significance, aiming to further institutionalize the Party’s line and policies, especially the resolutions of the Party Central Committee plenums and the 2013 Constitution. She said the session took place in the midst of the country’s positive developments. The national growth rate in the first quarter of 2018 was the highest in the last ten years. However, she felt worried about unexpected regional and international developments. The top legislator suggested the country focus on developing its potential, maintaining macroeconomic stability, boosting production and business activities, and preparing to minimize the negative impacts of global changes to ensure sustainable development of the national economy. The country should also continue to strengthen national security and defense, enhance diplomatic activities and safeguard national sovereignty, while upholding anti-corruption, thrift practice, and waste combat efforts, Ngan said. At this session, the NA will reserve three days for question-and-answer activities with innovations expected to increase dialogues and face-to-face debates in the NA’s activities, thus meeting voter’s aspirations. Specifically, each NA deputy will have only one minute to give a question and, after three NA deputies raise questions, the questioned official will have three minutes to give answers. The NA will exercise the supreme oversight of the implementation of policies and laws on the use and management of state capital and assets in enterprises and the equitization of state-owned enterprises during 2011-16. The legislative body will also adopt a resolution on the 2019 program on NA’s oversight activities and the establishment of the NA’s specialized oversight delegations for 2019. The NA will consider and make decisions on several important issues, including a report assessing the implementation of the socio-economic development and state budget plans in 2017 and the first months of 2018, the ratification of the 2016 state budget’s final accounts, and personnel work. Debating the draft Law on Special Administrative-Economic Units of Van Don, Bac Van Phong and Phu Quoc, NA deputies urged for adjusting the jurisdiction and competence of people’s committees in these special zones. The model of administration for the special zones introduced in the draft law won the approval of most deputies. Specifically, the People’s Council of a special zone would have no more than 15 deputies with a majority being full-timers and without any standing board or supporting units. The People’s Committee would have only one chairperson and two vice chairpersons. The People’s Council and People’s Committee of a special zone would share a supporting office and specialized units. Lawmakers made many comments on Article 32 regarding management and use of land in the zones, which says that investors may use land in special economic zones for production and business activities for up to 99 years. NA deputy Nguyen Van Than of Thai Binh province backed the allocation of land to investors for up to 99 years, saying this is a major breakthrough policy to attract investors in these zones. Meanwhile, NA deputy Truong Trong Nghia from Ho Chi Minh City proposed scrapping this provision, explaining this is actually an additional incentive for investors to transfer land which seems to be inappropriate. NA deputy Duong Trung Quoc from Dong Nai province suggested careful consideration of this provision, saying that special economic zones would be applied on a pilot basis only and may succeed or fail, so adventure is not accepted. “Prudent attention should be paid to the political significance of special economic zones, especially Van Don zone, otherwise, these zones might become places for population migration,” Quoc said. Minister of Planning and Investment Nguyen Chi Dung said the law-drafting committee proposed retention of this provision as the draft law would clarify which projects are eligible for 70-year land lease term and which ones are considered special and eligible for a land lease term of up to 99 years, and would also set criteria for identification of special projects. Voters and people nationwide hope that the NA, Government and all-level administrations will continue working to solve the problems they used to mention, said President of the Vietnam Fatherland Front Central Committee (VFFCC) Tran Thanh Man while reporting on voters’ and people’s opinions and petitions. He said since the NA’s fourth session in late 2017, the VFFCC Presidium and NA Standing Committee have received more than 3,460 opinions and petitions from voters and people nationwide. He noted the public expressed their trust in the Party’s leadership and the State’s steering and management role. They hope that due attention will be paid to settling the problems they have raised, such as ensuring social welfare; prioritizing development resources for disadvantaged, ethnic minority, disaster-hit and climate change-prone areas; ensuring social order and safety; and fighting crimes. The VFFCC Presidium asked the NA and Government to promptly institutionalize and effectively materialize the resolutions of the Party Central Committee (PCC), especially those on economic development, personnel work, and salary and social insurance reforms, which were issued at the fifth, sixth and seventh plenums of the PCC. They should promote their responsibility toward major issues discussed at this fifth session, Man said, noting that the parliament needs to press on with reforming NA deputies’ meetings with voters so that more people can express their opinions. In his report, the official asked the NA and Government to instruct related agencies and authorities at all levels to attach importance to agriculture, farmers and rural areas. Particularly, the cabinet should step up administrative reforms in all sectors and agencies, from central to grassroots levels. The Party and the State need to take drastic and effective solutions to fight corruption and waste and promote thrift practice in the entire political system and society. They also need to direct the strict handling of persons involved in corruption and waste cases, boost the recovery of assets related to corruption, and heighten the responsibility of leaders of ministries, sectors and administrations in this work, the report says.